If you recently lost a family member or loved one you are likely experiencing a range of heightened emotions as you process the loss. Anger, denial, confusion and grief are all common reactions to the loss of someone close. The last thing on your mind may be the legal ramifications of your loved one’s death. If, however, you were named as the Executor of the estate in your loved one’s Last Will and Testament, your loved one has put you in charge of the administration of his/her estate. You may also find yourself in charge of the estate if your loved one died intestate, or without a Will and you find yourself volunteering to be the Administrator of the estate. If you are unfamiliar with the probate process, retaining the services of an experienced Illinois estate planning attorney to assist you is a wise choice. To help get you started though, the estate planning attorneys at Hedeker Law, Ltd. have compiled some commonly used probate resources for the Northbrook, Illinois area. When they die, most people leave behind an estate that consists of all assets owned by them at the time of death. Probate is the legal process by which those assets are ultimately transferred to the intended beneficiaries and/or heirs of the estate. Probate also serves as the legal process wherein creditors of the estate may file claims against the estate and as a way to ensure that any tax obligations owed by the estate are paid. If a Last Will and Testament was executed prior to death, the individual named as the Executor in that Will oversees the probate of the estate. If the decedent died intestate, or without a Will, any competent adult may volunteer to be the Administrator of the estate. For the most part, the duties and responsibilities of an Executor and Administrator are the same. For convenience sake, the generic term “Personal Representative (PR)” is frequently used to refer to either an Executor appointed in a Will or an Administrator who has volunteered for the position. For more general information on the probate process, the American Bar Association has a section entitled “The Probate Process” on its website that you may wish to read. Although not from Cook County, the Lake County Probate Court offers an overview entitled “Decedent’s Estate” and a booklet entitled “Probate Court.” As both resources are from courts within the State of Illinois you may find them helpful even though they are not from the Cook County Court. Probate is typically opened in the county in which the decedent was a resident at the time of death. If the decedent lived in Northbrook, Illinois, the estate will likely be probated in the Probate Division of the Cook County courts. Most Personal Representatives (PRs) retain the services of an experienced estate planning attorney to assist during the probate process, particularly if the estate does not qualify for a small estate alternative to formal probate. If, however, you decide to proceed pro se, or without the assistance of an attorney, you will be expected to understand the Rules of the Circuit Court as well as all state and federal laws applicable to the probate of the estate. As a self-represented PR you may find The Southern Illinois School of Law Self Help Legal Center to be of assistance. Cook County also has a number of Help Desks located throughout the courthouse on various days and times. Check the website for days and times. The Cook County Court’s “Forms” section may also have some of the forms you will need to probate the estate. The probate process can be a lengthy and complex process that is difficult to navigate under the best of circumstances. If you recently lost someone close to you, it can be even more difficult to focus on what needs to be done. Retaining an experienced Illinois probate attorney to assist you allows you to focus on the grief process and dramatically decreases the possibility of making a costly mistake. If you do decide to retain an attorney to provide advice and guidance, a good place to start is with the American Academy of Estate Planning Attorneys website. The AAEPA is a national organization of attorneys who have chosen to focus their practice on legal issues related to wills, trusts, and estates. Membership in the AAEPA signifies that an attorney has proven experience in the areas of estate planning and/or elder law. In addition, the Illinois State Bar Association’s “Illinois Lawyer Finder” as well as the Cook County Bar Association’s Lawyer Referral Service may also be of assistance in your search for an attorney. The PR has a seemingly endless number of duties and responsibilities. At the top of the list is filing the appropriate petition with the Probate Division of the Cook County Circuit Court. When you file the petition you will need the original copy of the decedent’s Last Will and Testament along with a certified copy of the death certificate. You may obtain certified death certificates from the Illinois Department of Public Health. You will also likely need to conduct a thorough search to make sure you have identified all real property owned by the decedent. The Cook County Assessor’s Office allows you to conduct a search by name for property owned in the county. You are also required to notify creditors of the estate that probate is underway. Known creditors may be notified directly; however, for unknown creditors you must make notification via publication. As the Personal Representative of the estate you must prepare an estate tax return and determine if the estate owes any federal taxes. Every estate is potentially subject to federal gift and estate taxation. As the Executor/PR you are responsible for determining if the estate owes federal and/or state taxes. To help you make that determination, the Internal Revenue Service (IRS) website offers a general overview of the federal estate tax. They also have a “Frequently Asked Questions about Estate Tax” section that may be helpful. If the estate does owe federal gift and estate taxes, any tax obligation due must be paid before any assets are transferred out of the estate. Some states also impose a state gift and estate tax. Because the State of Illinois is one of these states, you must also determine if the estate owes estate taxes to the state. To find out more, navigate to the Illinois Attorney General’s website where you will also find forms. If you find yourself appointed, by the decedent or a court, to administer the estate of a recently deceased love one, you do not have to go it alone. An experienced Illinois estate planning attorney can help you through the process, allowing you to focus on your loss while simultaneously decreasing the likelihood of making costly mistakes. 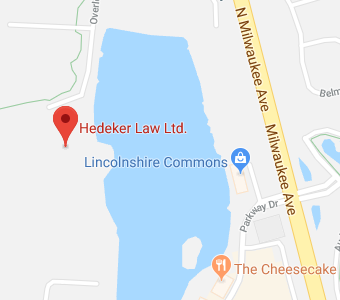 Contact the Northbrook, Illinois estate planning attorneys at Hedeker Law, Ltd. by calling (847) 913-5415 to schedule your consultation and find out how they can help you.